As far as we know Maize arrived in Africa in the 1500's. In Algerian cooking cornmeal is steamed for couscous, made into breads and griddle (skillet tagine) cakes, fritters, dumplings and porridges like polenta or hominy grits. Whole hominy is simply boiled to make a comforting gruel like dish or it is added to more elaborate soups and stews. One of my favorite fresh corn dishes is whole corn cooked in hot ashes. However. living in an urban setting it's not convenient for me to start a wood fire and let it smolder for hours. I use an oven method for slow roasted corn. First remove the silk from the corn, leave the husks intact and soak the corn for at least 30 minutes in cool water. Preheat oven to 300 degrees F, cover corn with tin foil and bake for an hour. Another obvious option is to grill it over very, very low heat with the cover on. However, I do not have a bbq grill at home. I made this last year and forgot to post about it. And now I can't find the photo I took of the plated dish. Slow roasted or quickly grilled corn is sometimes served with spiced salt or spiced butter. Melt butter in a small skillet, remove from heat and add the remaining ingredients. Brush over corn before serving. Cook's note: In Algeria lemon wedges are a very common addition to the table for squeezing on to foods such as corn, salads, tagines, and so on. This small pumpkin was baked in a 300F (167C) oven for about one hour. Bigger pumpkins take longer to cook. Cut the pumpkin in half, remove the seeds and membrane. If you like wash the seeds and dry them to make spiced pumpkin seeds. I have photos of some I made that I will post later. Place a pat of butter inside each half of pumpkin, cover the pumpkin with foil, remove foil about 10-15 minutes before it's done to add some color. Spices such as cinnamon, nutmeg and cloves can be sprinkled on about 15 minutes before the pumpkin is done. Drizzle with honey and sprinkle with pine nuts or almonds and dried fruits such as raisins, chopped apricots, dates or figs. This can be eaten as a dessert or as a side dish. 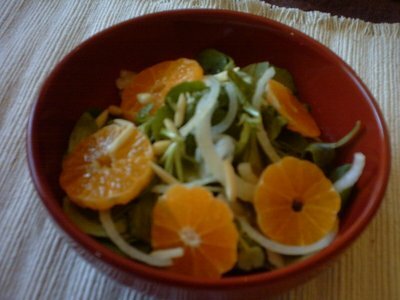 Another version of orange salad. Orange salads are clean tasting and help refresh and cleanse the palate especially during multi-course meals. I prefer to slice my onions much more thinly than shown in the photo. I did not slice these onions. This salad is only as good as the oranges and the sweetness of the onions used. If the onions you have aren't not so sweet soak them in cold water for about thirty minutes. A little sugar in the water helps too. Marinading the onions in 1 part vinegar and 3-4 parts olive oil help take the bite out of lesser quality onions. Orange salad variations include: thinly sliced fresh fennel (I prefer young, tender fennel for this), grated fennel (I use this method for older fennel), blood oranges, wild greens and herbs, almonds, walnuts, pine nuts, orange flower water (be careful, if you are not used to this it can smell almost cosmetic), rosewater (good quality ones actually have a refreshing aroma) olives, dates, radishes, grated carrots, shallots, sugar, honey and cinnamon. Algerian beet salads can be as simple as the one I show or more complex with wild greens and herbs, thinly sliced sweet onions and nuts. This is another recipe from my mise en place for Iftar. The clementine is a hybrid of a mandarin orange (Citrus reticulata) and a bitter orange (Citrus auratium) developed in Oran, Algeria by a French Missionary named Father Clement Rodier. Bitter oranges and clementinas are simply eaten fresh for dessert, made into marmalades, the juice is reduced to syrups for variations on orangeade (the bitter orange orangeade is especially delicious) and of course made into endless variations of salads. In Setif my mother would take me foraging for wild greens for fresh salads and soups. 4 clementines peeled and sliced as shown. These were very sweet and tender, no need to supreme them. 1/2 a sweet onion, thinly sliced soaked in cold water with a tablespoon of vinegar for about 30 minutes. 1 couple of tablespoons of nuts such as pine nuts or almonds. Vinaigrette made with 1 part white vinegar and 3 parts extra virgin olive oil, season with salt and pepper. Vinaigrette preparee avec un quart de vinaigre blanc et 3 quarts d'huile d'olive, set et poivre. Compose the salad as shown into individual portions or in a large salad bowl, add the vinaigrette to taste and toss. The sweetness of the oranges contrasts nicely with the tart vinegar, the bitter mache and sweet bite of the onions. For lunch this can be eaten with fava bean salad, khobz or kesra and maybe some fresh goat cheese. Yes, we make goat cheese in Algeria. Note: You can omit the onions and make a shallot vinaigrette. Yes we have shallots in Algeria and we use them in cooking and sauces. Rocket lettuce also makes a nice substitution for mache, and yes both are used in Algeria.